Group54 Heptacodium miconioides - Seven-son Flower, Seven Son Tree. Introduced from China about 1980, Seven Son Flower has not yet become well known, or available. It is desirable for many reasons; the bark exfoliates; the flowers bloom from August to October, there are purple fruits followed by bright calyces--like a second bloom. It will brighten a shrub border, is attractive grouped, can be an accent. It is a pleasing addition to a woodland setting. Multi-stemmed, rather upright, but spreading, Seven Son Flower will grow ten to twenty feet tall. Dark green leaves are three-four inches long, become purple tinged in fall. The fragrant flowers from late summer to late fall are small, creamy-white, borne in seven-tiered panicles. 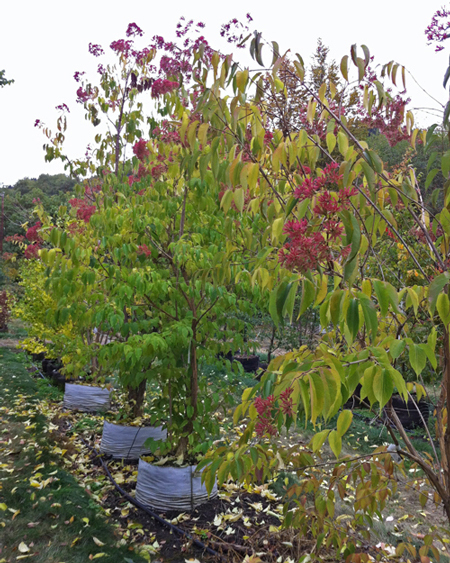 Adaptable to drier soils and light shade, Heptacodium is best in moist soils and full sun. I'm interested in: Heptacodium miconioides - Seven-son Flower, Seven Son Tree.